There's nothing like a nice warm casserole on a cold day. And when snow and ice prevented us travelling on Thanksgiving Day, I was left to my own devices to create a meal from what we had on hand. That included four small eggplants from our garden (two purple and two white, to be precise), and six San Mazarno tomatoes we harvested at Munson Family Farms, a few miles away. We had shallots from Munson's as well. Of course, this dish is supremely vata soothing and ideal for a chilly day in fall. It could also be quite pitta provoking; but the chickpeas, lime peel and turmeric do help to modify the dish. As a pitta, I found it acceptable on a vata day in context of a menu of pitta soothing dishes, as noted below. This dish is typically served over plain rice; we made ours a little drier and served it on the side with Persian Rice with Chard and Persian Winter Squash Soup. And the dish usually includes meat in the sauce, but our veggie version was delicious! The original recipe says to peel the eggplants; we didn't peel ours as a lot of the blood sugar balancing phytonutrients are in the peel Another option is to stripe them with a peeler, leaving stripes of peel on while removing some. Peel of half a lime, cut into small strips. ½ can of garbanzo beans, coarsely mashed. Preheat oven to 400° F. Cover a baking sheet with foil. Brush both sides of the eggplant slices with olive oil and place them on sheet. Cook for 20-30 minutes. In a medium-size saucepan sauté shallot and garlic in the olive oil until golden brown. Add ½ cup of water, the tomatoes, lime peel, mashed garbanzos, salt, pepper, and turmeric to saucepan. Cover and cook over medium-low heat until the tomatoes are soft and you have a nice saucy texture. 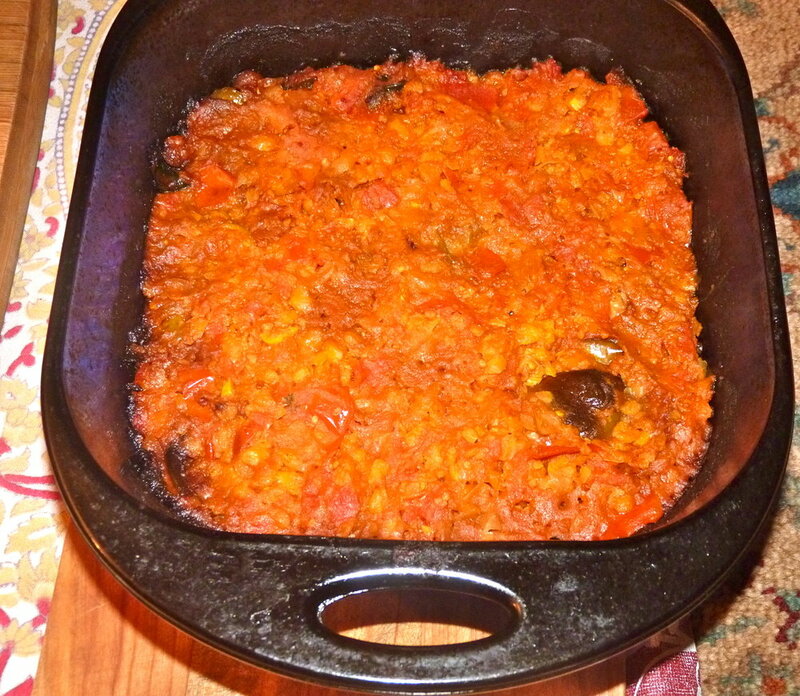 Place eggplants in a deep baking dish, top with tomato sauce. Cover and cook for 45 minutes in preheated oven.